Author: J.R. Rain, Rod Kierkegaard Jr.
All that Anne Rice crap is true, I thought on my way out the door; New Orleans really does have a vampire problem. Wow! MOON BAYOU by J.R. Rain and Rod Kierkegaard, Jr. is the first book I've ever read by J.R. Rain and served as my introduction to private detective, single mom and vampire Samantha Moon. I thoroughly enjoyed the story, the crazy quirky and historical characters and the humor! I have been going thru New Orleans' withdrawal since reading Suzanne Johnson's latest Sentinels of New Orleans book and this worked very well as an antidote. I had been a happy normal wife and mother in Orange County until ten years ago, when I was attacked by an evil vampire... and turned into one myself. It's made my life since gross and scary and, let's face it, weird. I was enthralled with Samantha! She's smart, fierce, feisty, caring and down-to-earth. She had previously worked in law enforcement and now runs her own private investigations firm. If you are looking for a romance, there's no real romance in this installment - though Samantha mentions and misses her shifter boyfriend many times. The author did a great job filling in what I, as a newbie reader, needed to know regarding Samantha and her prior history. However, I do believe that my enjoyment would have been increased if I'd read that previous series and had a prior connection to Samantha, her family and boyfriend. The good news is that my interest in reading Samantha's previous adventures has been officially piqued and I hope to go back and catch up with her soon! This book opens as Samantha accepts a case to find a couple's missing daughter who was last seen in New Orleans, which is still reeling from Hurricane Katrina. Samantha, based in California, hops on a plane and travels to New Orleans not aware that she has a price on her head by the Tete de Mort Krewe vampires there. As Samantha begins her investigation, she discovers that the missing daughter's roommate also disappeared the day following her clients' daughter. Of course, things are not as she expects and there's much more to the story of the missing roomies. When she confronts a modern-day descendent of voodoo queen Marie Laveau, Samantha finds herself catapulted into the past right before the Civil War. Lincoln has just run for and won the Presidency; Southern states will be seceding from the Union after Lincoln's inauguration. It's quite interesting as we are treated to meeting or becoming aware of characters including, but certainly not limited to, Senator Jefferson Davis of Mississippi, the original Marie Laveau, and notorious Countess Elizabeth Bathory, the vampiress who bathed in the blood of young women, and was the disciple and beloved of Vlad Dracula. Not surprisingly, New Orleans is also teeming with supernaturals - vampires and werewolves abound - and preternatural politics plays a part in the story. I picked up some fascinating tidbits! For instance, I did not know that duels were often fought under a tree called the 'vamp tree' - it was called that because its roots were fertilized with blood. AND, New Orleans' history is rich with missing people. They're the murder capital of the country and have always been. Makes me want to continue visiting there only via my books! Of course, Samantha desperately wants to go back to her own time period, with her kids and her hunky boyfriend. You'll have to read this one to find out if she gets there! My first thought was that a tornado had somehow picked me up and carried me off, like in the Wizard of Oz. No old witches pedaled by, and I didn't see any flying farm animals or chicken coops, and after a few agonizing minutes, I fell deep into unconsciousness again. I put the carpetbag on a ledge, and then, hanging upside down by my razor-clawed feet, slept until sunset. A first for me, and actually quite comfortable. "You'll be in good hands with the colonel, you'll see." The colonel? Okay, I was obviously stuck in a Gone With the Wind theme park. Or maybe a Kentucky Fried Chicken farm. "Tell me, Mrs. Moon, will your need for sustenance trouble you on this excursion? How often do you need to feed?" I couldn't tell whether his interest was scientific, or whether he was afraid I might plunge my teeth into his throat at any moment. I really enjoyed my first foray in the world of Samantha Moon. The time traveling, voodoo aspects, and setting in New Orleans all worked together to snag and hold my attention. I was not happy, though, with the ending, which is a pseudo cliffhanger. Obviously, I can't wait for the next book! I sure hope it won't be a long wait! 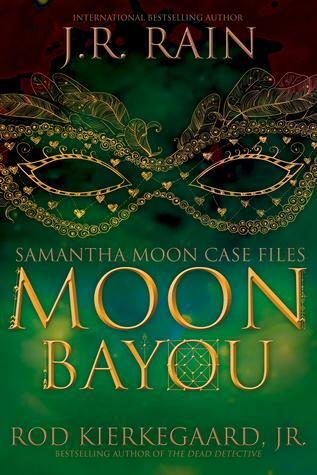 I would think that MOON BAYOU would be a must-read for Samantha Moon fans. I mentioned it before - but if you enjoy the Sentinels of New Orleans series - you really should check out this book! Indeed, I highly recommend MOON BAYOU to anyone who enjoys paranormal urban fantasies!